We can Give proper name to any Variable which is human readable. Compiler won’t understand this name , This is only for human understanding. Variable name is only the name given to the “Memory address”. Variable name maps into “Address inside” and then by considering mapped address compiler processes data. We have declared variable means “We have created one empty container which will hold data“. Depending on the type of Variable we can store any value of appropriate data type inside Variable. Suppose we have “Integer Variable” then Value inside variable will be of type “Integer“. 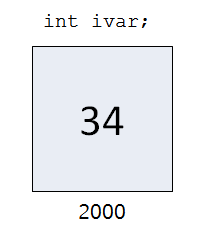 Simple Variable can only hold one value at a time. Variable can hold data ,it means there should be a container. So container must have Starting Address. Address of variable = Starting Address of Memory where Memory is allocated to Variable. While declaring a variable we have to specify type of variable. Type of variable tells compiler that – “Allocate memory for data of Specified type“. If we declare variable of type Integer then compiler will allocate memory container of size 2 bytes and container will be able to store integer data only. We can use sizeof operator to calculate size of any data type.